Marriages in India can be overwhelming and there is always a need for more cash. You must be getting a lot of emails about the pre-approved loans or quick personal loans every day. Taking a loan is not a bad thing, it can help you out in various situations. But it is important to keep a few things in mind before you avail a loan. 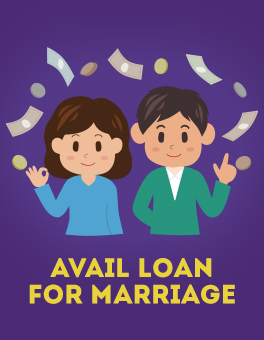 • Safe in advance: Instead of completely depending on the loan for the marriage it is advisable to have some savings or investments kept aside. This will reduce the load of EMIs. • Cut the cost: It is always good to have a reality check in between, just so that you don’t go overboard. • Talk to family or friends: If you are in need of small personal loan, you can ask your family or friends to help you out. They might not even charge you interest. But make sure you repay them on time as money matter can ruin relationships. • Shop for better rates: You found the perfect shoes for the wedding? Wait for it. Check for the best price in which you can get. Brands and online stores keep having discounts every now and then. Shop when it is at its lowest. • Money loan: If you don’t want to ask for money from your friends or family and what to keep it private about taking a personal loan, this is the best option for you. You can get a cash loan from quick loan apps which provides loan with minimal documentation. You don’t have to visit any physical brand or bank, the entire process can be done online. One can take a loan starting from INR 10,000 to INR 2 lakh. Even the cash loan duration with such loans is short starting from 15, 30, 90 and 180 days. The interest rates are quite low, which works our best in emergency situations. The repayment process is quite smooth with quick loan apps. • Choose the lender wisely: There are multiple lenders available in the market. Make sure you choose the aptest one for your need. Lenders which you can approach but make sure you know the pros and cons of each of them. There are various types of Go for secured apps like CASHe, who do thorough research and offers the best to its users. Anyone who is a salaried employee can get a personal loan from the quick loan apps. As long as you are between 23 years to 58 years old and possess all the required documents you can get a cash loan online. It is best to avoid a personal loan if things are manageable on your own until and unless you really need it. Before availing a loan read all the process carefully and compare interest rates. Assess the EMIs and whether you will be able to manage to pay it on time once you get the money loan.